The old hut Raudfjordhytta at Bruceneset has got one of the nicest views you can imagine. From here, you can look over the whole of Raudfjord. A red beach with driftwood is stretching under a blue sky. Stockholm-Sven lived in Raudfjord for many years, he built a number of huts. In 1934-35, his nearest neighbours were Christiane and Hermann Ritter and Karl Nikolaisen, who were wintering at Gråhuken in Woodfjord. In her famous book “A woman in the polar night”, Christiane Ritter describes how they want to visit Stockholm-Sven in his hut at Velkomstpynten on Reinsdyrflya, but he was not at home. Hunter had wintered in Raudfjord before Stockholm-Sven came in the 1920s. Erik Mattilas from Tromsø, a well-known skipper in his days, wintered here in 1907-08. This time, it went wrong, and it was to be Erik Mattilas’ last wintering. He did from scurvy in spring 1908. His grave with a wooden cross is on top of the little hill at Bruceneset – it is hard to imagine a grave more loneseome or more beautiful. A little mountain hike in Raudfjord on a fairweather day like this is Spitsbergen at its best. An altitude of 334 metres is enough for the greatest views. 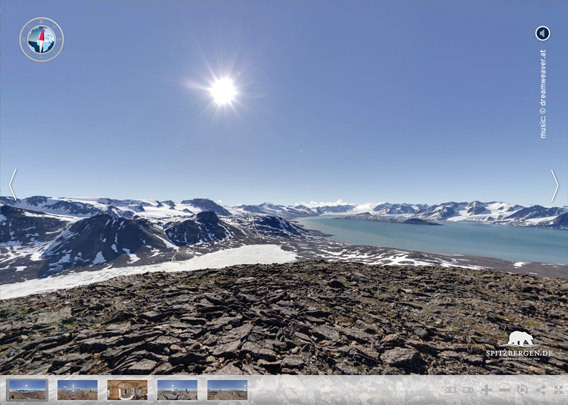 In the east, we are looking over Richardvatnet, one of Spitsbergen’s biggest lakes, and towards a lagoon landscape near the outer coast. In the west, there is Raudfjord close to us. Its western shore, on the opposite side, is rugged, steep and glaciated. Compared to that, the eastern shore, which is our side, is almost lovely, it is open enough to go hiking and get lost in this scenery.